Categories: Divine Names, Sri Swamiji's Kirtans. 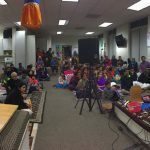 By the immense grace of Sri Swamiji, Sri.Ramanujamji’s 2012 USA Satsang tour began in a grand manner in Atlanta, Georgia. A four day program was conducted in Montessori Scholars from Thursday, October 4th 2012 to Sunday, October 7th 2012. A three day Inner Transformation lecture series on “Essence of Srimad Bhagavatham” was conducted on the first three days. 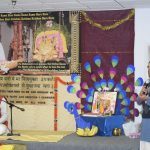 On the first day, Sri Ramanujamji delivered a lecture expounding on the greatness of Srimad Bhagavatham with reference to first three slokas of Bhagavatham. On the second day, Sri Ramanujamji eloquently talked about Sage SutaPauranika’s exposition of Srimad Bhagavatam. On the third day, he talked about instances from Draupadi’s life-history thereby flowering compassion in the listeners. About 80 people attended the program everyday to hear the nectarine droplets. 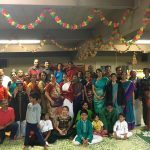 On the last day, GOD Atlanta Chapter celebrated a wonderful cultural event “A Celebration In Divinity” followed by a Mahamantra Mass Prayer in the presence of Sri Ramanujamji. The theme of the event was “Ganam, Nruthyam, Prarthana”. 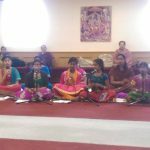 Atlanta Gopa Kuteeram kids participated with zeal and joyfully rendered kritans composed by Sri Swamiji and this was followed by dance performances on Sri Swamiji’s divine compositions. 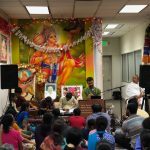 Followed by the performances, Sri Ramanujamji delivered a powerful and enlightening lecture on the power of Bhagavan Nama kirtan illustrating the importance of chanting the Mahamantra. He very beautifully explained that chanting Mahamantra does not have any restrictions and that the chanting of divine names is the means and end in Bhagavatha Dharma. 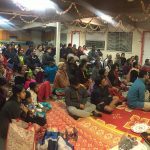 About 150 people enthusiastically took part in the program and listened with rapt attention to Sri Ramanujamji’s inspiring lecture on the greatness of Mahamantra.